(3) Turn the blind spot monitor main switch assembly (warning canceling switch assembly) on. (5) Switch the blind spot monitor sensor to Test Mode using the Techstream. Enter the following menus: Body Electrical / Blind Spot Monitor Master or Blind Spot Monitor Slave / Utility / BSM Master beam axis inspection or BSM Slave beam axis inspection. 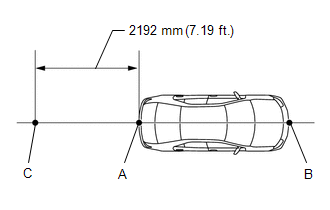 (a) When performing the blind spot monitor beam axis confirmation, move the vehicle to a place where the space shown in the illustration can be secured. Perform this inspection on level ground. Make sure that there are no metal objects around the vehicle or on the ground. Unload the vehicle before beginning the inspection. Confirm that the tire pressure is correct before beginning the inspection. 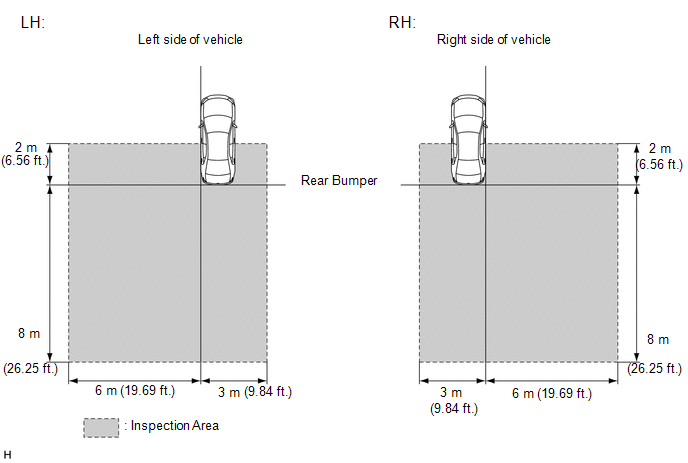 Do not place an object other than the reflector (such as a large metallic object) in or allow people to enter the inspection area (W 9 m (29.53 ft.) x L 10 m (32.81 ft.) x H 4 m (13.13 ft.)) shown in the illustration. Check that DTC C1ABB and DTC C1ABC are not output. (1) Hang a weight with a pointed tip from the center of the tail gate handle assembly, and mark the rear center point of the vehicle (point A) on the ground. 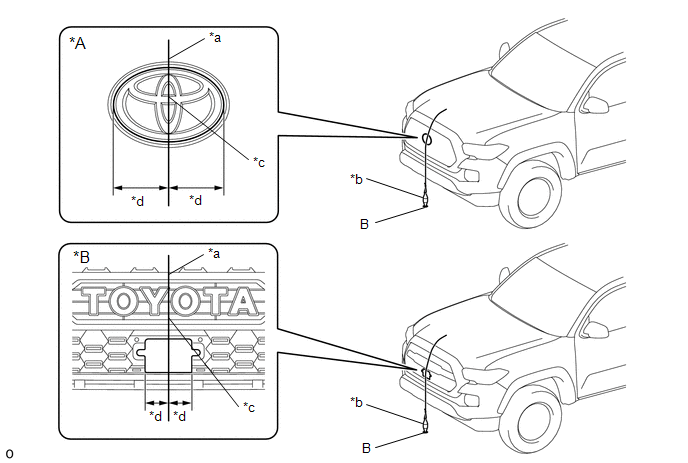 (2) Hang a weight with a pointed tip from the center of the radiator grille emblem, and mark the front center point of the vehicle (point B) on the ground (placement position). 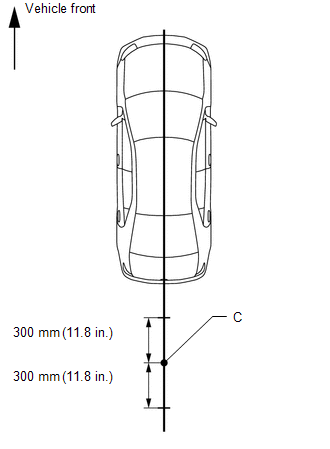 (3) Draw a vehicle center line so that it passes through mark (A) and (B) (front and rear center points). (5) Prepare 2 pieces of string of 600 mm (1.97 ft.) in length and secure the end of each string at a point 300 mm (11.8 in.) from mark (C) as shown in the illustration. (6) Pull the end of each string and mark the position where each string meets on both the left and right side (marks (D) and (E)). 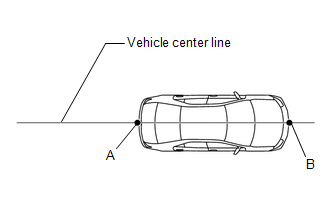 (7) Draw a line (P) so that it passes through mark (D) and (E) and is perpendicular to the vehicle center line. 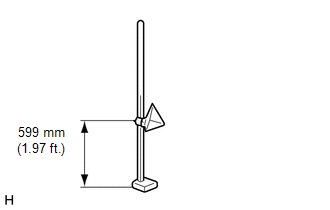 (8) Set the reflector at the position (Z) shown in the illustration below. Set the reflector so that its center is 599 mm (1.97 ft.) above the ground. 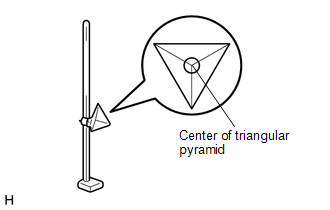 The center of triangular pyramid is the reference point for the setting position and angle. Set the reflector as shown in the illustration so that its center of triangular pyramid faces the blind spot monitor sensor. Perform the operation as precisely as possible. (c) Perform the blind spot monitor beam axis display. (5) Enter the following menus: Body Electrical / Blind spot monitor Master or Blind spot monitor Slave / Utility / BSM Master beam axis display or BSM Slave beam axis display. 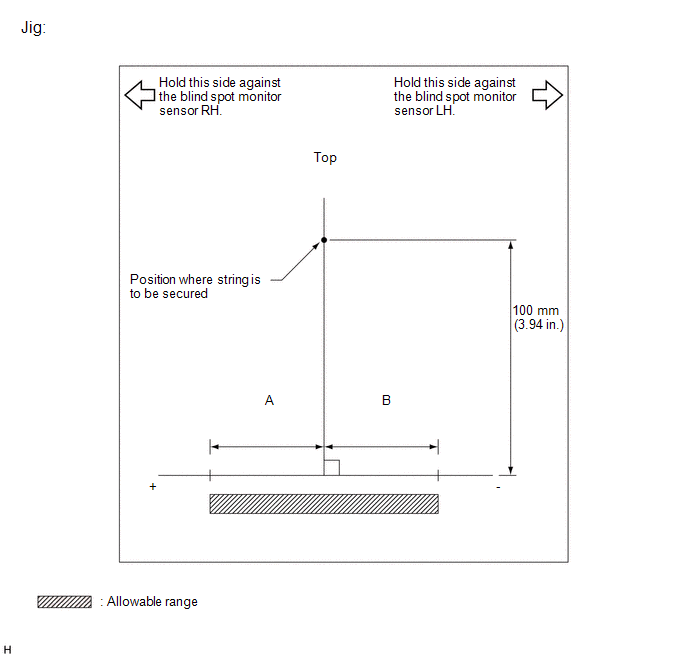 (6) Check the results displayed for the BSM beam axis display. 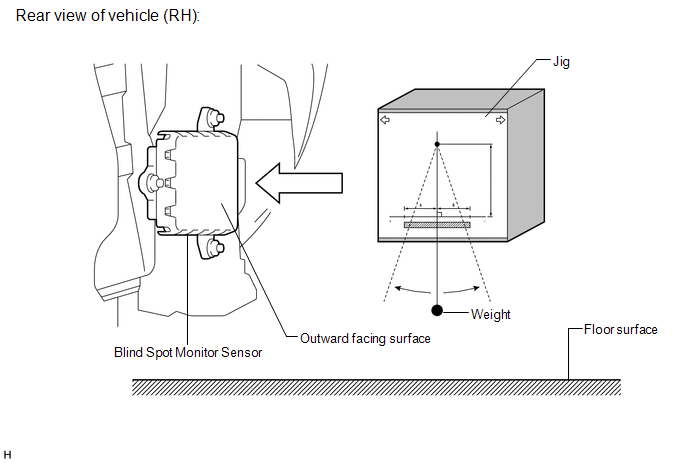 If the results are outside the allowable range, it is possible that the reflector position is incorrect, there is a metallic object near the inspection area or the blind spot monitor sensor installation condition is abnormal, so check the reflector positioning, the inspection area and the blind spot monitor sensor installation condition, and perform the inspection again. (7) Perform the blind spot monitor beam axis adjustment using the Techstream. Enter the following menus: Body Electrical / Blind spot monitor Master or Blind spot monitor Slave / Utility / BSM Master beam axis adjustment or BSM Slave beam axis adjustment. When values on the axis display are in the allowable range, performing this adjustment compensates the values to the normal value. (a) Remove the rear bumper assembly. (b) Remove the rear bumper extension LH. Remove the rear bumper extension from the side that is being inspected. 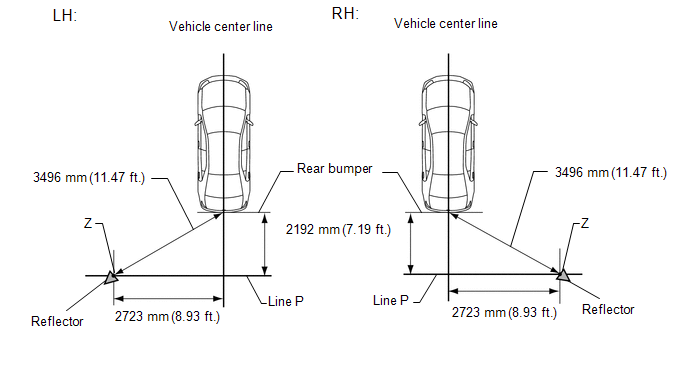 (c) Remove the rear bumper extension RH. (d) Install the rear bumper assembly. When installing the rear bumper, install it with the rear bumper extension removed. 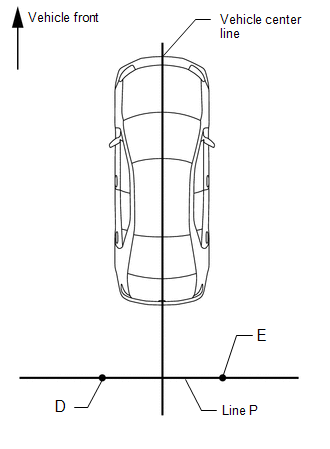 (e) Attach a jig similar to the one shown in the illustration to the outward facing surface of the blind spot monitor sensor and check that the blind spot monitor sensor is perpendicular to the floor surface or within the allowable range. 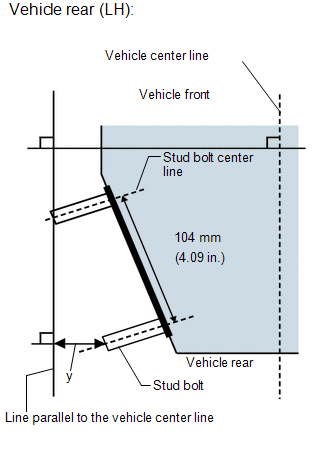 (f) Using the sensor installation stud bolt center lines as a reference, check that the stud bolts are as shown in the illustration. If the results are not as specified, it is possible that the blind spot monitor sensor installation area (frame, stud bolt) is deformed, so make corrections as necessary.